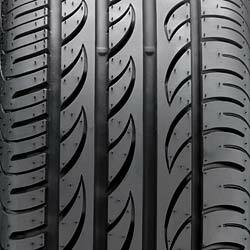 Tires: everyone has them, we know cars generally need them, they are usually round. When do you change them? 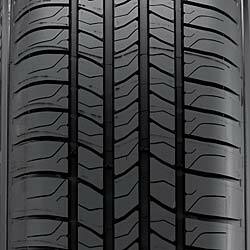 What are some things to think about when you are looking for replacement tires? How do you read all that stuff on the sidewall? Tires are wear items. They see the road everyday; asphalt, concrete, sand, mud, dirt – everything. Each wears the tire at a different rate. They easiest way to tell when your tires are near their end is the wear bar indicator. Looking at the sidewall of a tire, check for V-type markers or other indicator (logo) at the edge of the tread pattern. Many manufactures use their company logo as the indicator. Or run your fingers through a tread grove until you find a wear bar. When the tread hits that bar then you are at the end of the tread cap compound and getting near the overlay and belt package – change ASAP. Is that the right time to change your tires? No. 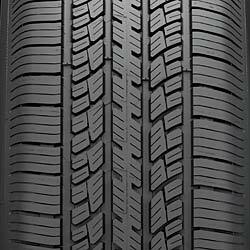 As the tread depth is reduced dry response increases and wet traction decreases. You’ll like the dry response; carving out tight lines on your favorite back road. Come rain, you’ll be so white knuckled you’d swear you mangled your steering wheel. Do the old “Abe’s head is showing, time to get tires” trick? Time to get a new President. President Washington that is. Tires are at the end of their wet weather life at about 3mm tread depth; which is the distance from the lip of a quarter to the top of Washington’s head. That’s right. 25c can save you in the rain. Summer category also contains Extreme Performance Summer (EPS) and Maximum Performance Summer (MPS). What’s the difference? Rain duty and life. EPS tires are for those who want the most traction you can get. To the heck with rain. These tires typically resemble racing tires you see on Sundays more than your average tire. Large tread blocks. Shallow tread depth. Expensive tread compound mixtures (silica + carbon black). MPS tires still offer a lot of dry traction, but also include wet traction as part of their development and design. More tread depth (live longer). Still can use the expensive tread compounds. The tread design also can move more water. On a car you daily drive, will you notice the difference between EPS and MPS? Yes and no. There is more ultimate grip in an EPS tire. It’s also likely to react quicker to driver inputs. And have more traction in transitions. If you’re pulling that off on a public road. I have a handful of friends in nice blue uniforms that would love to have a chat with you. But if you autocross or road-race – that’s the tire you want. MPS tires can offer you most of everything the EPS could. In a daily driver, the extra rain use is something you will notice. And more life out of the tire before the next replacement. Ultra High Performance All-Season, Performance All-Season, and Passenger All-Seasons. Very similar breakdown as EPS/MPS tires. This tire can also handle light snow duty on top of summer dry days and spring rains. UHP AS can handle higher speeds before failure when compared to their P AS and AS cousins. Grip levels are traded off for better wet and snow use. Life is typically higher than MPS. And compounds are different. Snow duty – snow tires. Discussed below. “Hey, you’ve confused me now. What tires do I need?” If you drive you car hard or take it to performance events, then you’ll want EPS or MPS tires. If you live in a region that gets very light snow every blue moon, then UHP AS / P AS or AS might be for you. Size: ___/__R__. Example: 235/50R18. 235 is the section width of the tire. Measured from mid-sidewall to mid-sidewall in mm. It is not the actual tread width. 50 is the aspect ratio to 235. Example of 235/50R18, 235*0.50 = 117.5mm. That is the sidewall width. 18 is the bead diameter. That should match your wheel diameter. Service Description is the number followed by a letter. It’s the load rating a tire can safely see and speed limit the car can safety drive to. The minimum I would recommend on a Mustang is S. S rating is to 112 mph (and where the OEM limiter is set to). EPS/MPS folks who have retuned the limiter and road race want V (149), W(168), Y(186), the last two of which are listed as subsets of Z-rated (149mph+) tires. 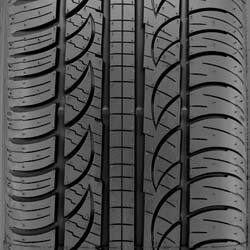 A W-rated tire, of the same dimensions shown above, would appear as 235/50ZR18 W.
UTQG: Tread wear grading. Here is a simple trick for using them. Take the rating, divide by 100 and multiply it by 7200. Example UTQG of 400: (400/100)*7200 = 28800 miles. It’s not foolproof. But a quick way to figure how long the tires will last. Second letters are the straight line wet traction grade and temperature grade. AA has the highest coefficient on in a wet straight line. Temperature A grade can withstand more heat (dissipate heat quicker) and can drive at speed longer than a B or C grade. Mustangs will want AA A or A A. Load: Standard Load (SL) and Extra Load (XL). XL tires have a different internal design that allows for the tire to handle more loads. XL tires typically also have stiffer sidewalls. That will give them an increased response in turning and cornering. LRR: Low Rolling Resistance. Soon you will see more and more tires with LRR and a rating. DOT will be making that a mandate for new tires soon. Lower rolling resistance tires achieve higher miles per gallon because the tires expend/waste less effort on the road surface (force required to maintain forward movement). 3%/5% average increase in miles per gallon can be seen. Winter time is always quickly approaching. Tire choice and tire size are important to having a safe and fun winter. Heed our warning! Every year I see the same threads on forums or in the news. You have seen them too. “I crashed my car…” the Staff here is looking out for you! First off, extreme performance summer tires – do not run them. The tire compounds in many extreme summer, often silica based (A046, A13C, Z1*, RE11, NT05, RT615K, etc), are not designed to perform in sub 50 degree weather. It is dangerous to drive them in temperatures below that. You will have instant traction loss without any warning (on dry or wet pavement). Now, to use all-seasons or to use dedicated winters – that is the question. The answer, well, that’s up to you. For consistent colder temperatures, icy conditions, and heavier snow – dedicated snow tires may be right for you. Tread patterns will be different, compounds often different, constructions as well. Treads will have extra sipping in their design to help grip in icy conditions. And patterns are often claw like to give some extra grip in snow. And general rule of thumb, when snow tires are below 50% of life — time to replace. You are relying on the extra tread depth. Once that is worn, they are back in the all-seasons performance range. Remember this mantra: narrow and taller for winter – wider and lower for summer. Say that to yourself over and over. Why not wider? 255/245/235 v. 225 or narrower — wide tires will act like a snowboard over snow. You also will push up more snow under the tire. Not helpful in bad weather. If you can fit them. Smaller rims means cheaper tire costs. Make sure the rims clear the brake rotors and calipers. …when in doubt. 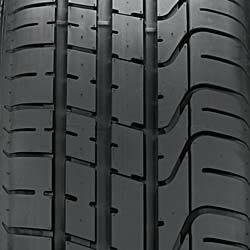 Are they the best tires for your application? No. If you don’t want to explore other tires – they are a sure bet. Over the next few months I will be writing about replacement tires, width and diameter changes, and weights.